Cells named with plain text simplify the structure of complex formulae. However, clarity is still a problem in large tables with many variables. Which is the name for which reference? 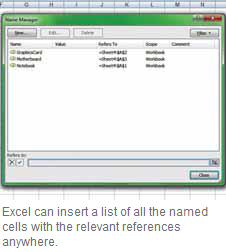 Excel provides the option of inserting a legend of the cells named with plain text and their references at a desired point. Create a list of the used names and references, ideally in a separate sheet. For this, click the tab of an empty table sheet on the lower border of the application. If all visible tabs are in use, use [Shift]+[F11] to create a new table sheet. Position the cursor in cell ‘A1’ in the new table sheet. This is where the table calculation later inserts the list of names cells. Click ‘Use in formula’ in the ‘Formulae’ tab sheet in the ‘Defi ned Names’ field in the multitaskbar of Excel 2007. In case of older versions of table calculation, use the menu command ‘Insert | Names | Insert’. Click ‘Insert List’ in the ‘Insert Names’ dialog.